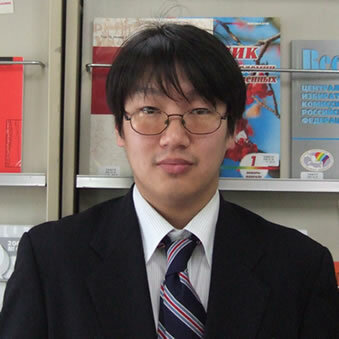 Poland: Approaches from Humanities Fields"
On May 1, 2008, Mr. Nomachi Motoki started his career as a new associate professor of the SRC. Having received the support of Hokkaido University, the SRC called for candidates for associate professor who were requested to be able to conduct macro-regional and comparative studies of Slavic Eurasia and the neighboring territories. Thirty-two people applied and, as a result of careful consideration that continued for two months, Mr. Nomachi was selected. Mr. Nomachi was born in 1976 and obtained an M. A. degree at Tokyo University, Graduate School of Humanities and Sociology in 2002. Parallel with doctoral courses at this school, Mr. Nomachi was educated at Belgrade University and, four years later, obtained permission to submit his doctoral thesis at its Department of Slavic Languages and Literature. In addition, during 2003−2005, he taught Japanese at the Faculty of Oriental Studies of Warsaw University, based on a contract between Tokyo and Warsaw Universities. Teaching Japanese, he researched Slavic languages in Warsaw, too. He has published nineteen academic papers: eleven in Russian, four in Serbian, one each in Polish, Slovenian, English, and Japanese. He covers a number of languages belonging to the Eastern, Southern, and Western Slavic groups, including Kashubian and Slovenian. He is vigorously writing a doctoral thesis, questioning the traditional classification of three subgroups of Slavic languages, which will be submitted to Tokyo University in 2009.